5th Januar, Rajanagar: The Catholic community in Kharem Pathar village, under Rajanagar Parish had every reason to rejoice, for on 5th January 2014, Bishop George Pallipparambil SDB, the Bishop of Miao, blessed the new village church in the presence of Mr. C. C Singpho, the local MLA, and the Singpho Raja. There were about one thousand people who gathered for this happy occasion. 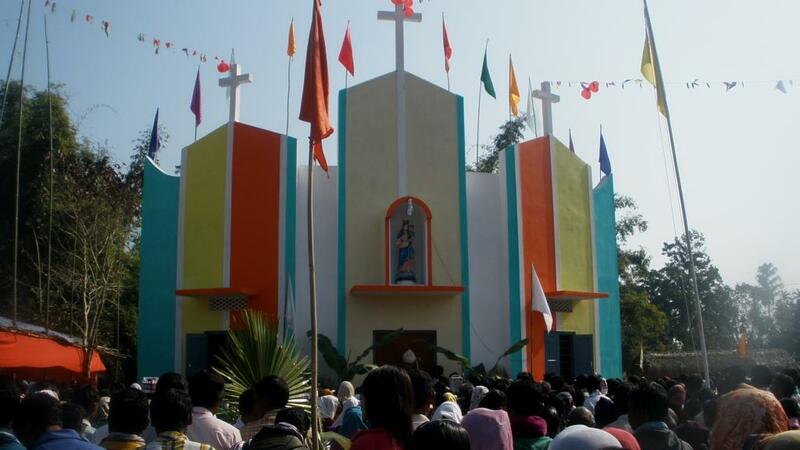 Kharem Pathar, is one of the big villages of Rajanagar Parish, is a historical place for Bishop George as he had the joy of celebrating the first Holy Eucharist in this village in the year 1984. Bishop George was happy to see two of his past pupils from the Bible School. He made one of them to cut the ribbon and the other to hoist the flag. Bishop George, speaking to those gathered for the occasion said with a smile, “Before you fight against China or Pakistan, you should fight against two things: alchohol and drugs”, inducing smile on every face. Hon’ble MLA C. C. Singpho also echoed the same thought. Sixty Five children received first Holy Communion and Confirmation.